CM Magazine: Showdown at Border Town: An Early Adventure of Paul Martin. (Leaders & Legacies, Bk. 3). 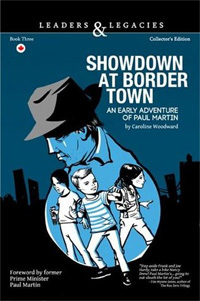 Showdown at Border Town: An Early Adventure of Paul Martin. (Leaders & Legacies, Bk. 3). 227 pp., trade pbk., $12.95. Martin, Paul, 1938- -Childhood and youth-Juvenile fiction. Paul knew that Inspector Ward would be helpless from that distance away if he was forced to drop his gun. Unless I can create a diversion. "Hey, Officer Nash!" Paul looked behind Bud Brunner, remembering the name of the officer who had knocked on the cottage door when they were hiding under Bud's table. "Help us!" "Nash?" Bud sneered, turning around while still holding Tom. "If he's going to help anyone, it'll be..."
At the same moment, Tom slammed his foot as hard as he cold into Bud Brunner's shin. The shock of the pain allowed Tom to wrench free. Tom dove to the left and Paul and Abby ran to the right so that Bud Brunner was out in the open - alone. It was the break he needed - and he wouldn't blow it. Inspector Ward, with gun still in hand, heard the Martin boy's diversion and then saw what the other youth had done to wrestle free. Still, the man was fast. He held his gun up and aimed it in a snarl at the boy who had kicked him. The inspector aimed and fired in one motion. The use of real historical figures in fictional situations seems to be growing, with works like Abraham Lincoln, Vampire Slayer, being an extreme example of this trend. Fireside's "Leaders & Legacies" series consists of mystery novels about the prime ministers of Canada for readers in their early teens. The first was The Mystery of the Moonlight Murder, featuring John Diefenbaker, and the second, The Legends of Lake on the Mountain, centering on John. A. Macdonald. The latest, Showdown at Border Town, has as its amateur sleuth former Prime Minister Paul Martin, who writes in his foreword that he is pleased to be the "Sherlock Holmes". Martin praises the young author, Caroline Woodward, and for good reason. Just a couple of years ago, when Ms. Woodward was a Literary Arts student at Ottawa's Canterbury High School, she won a contest sponsored by Fireside with the prize being the opportunity to author the Paul Martin mystery. Showdown at Border Town is well-organized, well-written and enthusiastic about the Martin family's principles. Woodward's extensive research included interviews with the late Mrs. Mary-Anne Bellamy, Paul Martin's sister, who appears as a minor character. The novel is set in 1950, when Prime Minister Martin was 12-years-old and spending the summer with his family at their cottage at Colchester on Lake Erie. Colchester is near Windsor, which is just across the border from Detroit, MI. Paul Martin Senior, who eventually became Canada's Minister of Health and Welfare, was then Member of Parliament for a Windsor area constituency and spent his summers there at the cottage with his family. The plot concerns Ontario Provincial Police efforts to clean up the cross-border smuggling of liquor. Young Paul gets involved because, Tom, a First Nations youth from Walpole Island reserve, living with the Martins for the summer, disappears from his job with an unfriendly, reclusive commercial fisherman. Paul refuses to believe that Tom abandoned his job, and, with the help of a fictional friend, Abby, he snoops around. Their investigations include a search for a "blind pig" in downtown Windsor and their captivity in the hold of a fishing boat. While providing suspense and action, Woodward highlights Martin family values which later came into play in the policies and programs that both father and son pursued in office. Prime Minister Martin was pleased about the Aboriginal element in the novel because the well-being of First Nations people has been one of his lifelong concerns. At the end, Woodward provides information about the Martin Aboriginal Education Initiative. Although CCF Premier Tommy Douglas of Saskatchewan was the father of Canadian medicare, Paul Martin Senior's federal Hospital Insurance and Diagnostic Services Act was a significant contribution, as Woodward notes in her "Areas for Further Study". Woodward shows the devastating consequences of illness in pre-medicare times through Tom's younger sister, who is stricken with polio. Paul Martin Senior says: "[S]ome think that health care should be a basic right." Paul Martin Senior and his son also meet with a constituent in debt because of business expansion. Paul Junior learns the lesson to "get rid of debt as soon as you can." In "Areas for Further Study", readers learn that "In the 1990s, Finance Minister Paul Martin managed to eliminate the deficit and left a surplus when he left office as Prime Minister." Perhaps Fireside might consider expanding this series beyond the nation's prime ministers to include other Canadian political leaders, and indeed, to men and women in other walks of life who have made a significant contribution. Expansion would allow for a variety of world views and political perspectives. As things stand now, only one future novel will have a girl as the protagonist since Canada has had only one woman prime minister. Meanwhile, Showdown at Border Town is an excellent novel for young people. Let's hope Caroline Woodward writes more. Ruth Latta's young adult/teen novel, The Songcatcher and Me (Ottawa, Baico, 2013, baico@bellnet.ca ) is set in 1957.